The story of how one small Amazon tribe is fighting furiously to defend their future – and ours. Produced by local citizen activists, this short documentary is a tool for everyone to inform and empower friends and neighbors to take action against the real threat of fracking. Sacred Land, Sacred Water, a multimedia documentary, is the story of science and citizens working together to resist the oil and gas lobby’s efforts to pass a fracking-friendly ordinance in Sandoval County, New Mexico – threatening the sole drinking water aquifer for the population of the greater Albuquerque area. In 1974, my 20-year-old parents and uncle Andy built their own canoes, launched them into the Pacific, and became some the first people in modern history to canoe from Washington to Alaska up the Inside Passage. My brother and I grew up paddling those wooden canoes in the Virginia rivers and the 1974 adventure became legend in our family – shaping who we’ve become, how we view our parents, and how our parents view themselves. In the summer of 2017, we renovated those canoes and with our aging parents completed their 1974 journey. The Passage is a story about growing up, growing old, and the wild places that define us. Terry & Monique gave up their careers as opera singers in Europe to pursue their passion for ecological farming and to build a food-community in the heart of Canada. We follow their young family and a select group of farmers and scientists through a challenging season as they blend ancient traditions and cutting edge science to grow food ecologically in a Changing Climate. 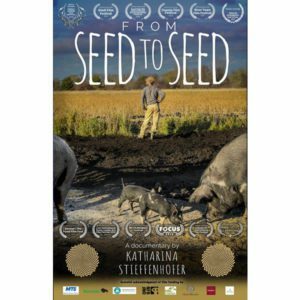 A hopeful story and Canadian perspective on a Global social movement that aims to regenerate the land, farming and communities toward a healthier and more sustainable future for all of us. The greater Haines area is a singularity in the world. The Chilkat Valley represents one of the last untouched wilderness areas. The Bald Eagle Preserve and the Chilkat Indian Village have a right to exist. This intrinsic value should not be threatened by a looming, foreign, extractive corporation. An invasive plant is spreading across Ethiopia’s largest lake. This film takes you to the frontline of this environmental catastrophe and how the community is working to stop this plant and save the lake. Two first-time filmmakers stop their lives to find out why rhinos are being killed for their horns. Carving out six months for the project, the women quickly find themselves immersed in a world far larger and more dangerous than they had imagined, only emerging from their odyssey four years later.